When it was announced there would be a mini-series comic written by Tom King which focused on how superheroes dealt with trauma that sounded interesting. I believe it was first called, "Sanctuary," and then later renamed as, "Heroes in Crisis." The idea of taking a serious look at the kind of psychology required for someone to want to dress-up in a garish outfit and be a vigilante is of course nothing new (hello there, "Watchmen,"), but it sounded like a welcome idea that if done well could be a good read--after all, Batman really has a lot of issues to work-through. 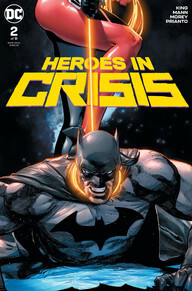 The problem with, "Heroes in Crisis," that has become ever the more apparent with its second issue is that it doesn't know if it wants to be a comic that does that in a thoughtful mini-event or if it wants to be a BIG event comic full of shocking deaths and mysteries. 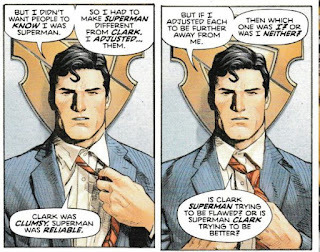 "Heroes in Crisis," has some intriguing moments of what look like recorded bits of assorted heroes talking to an unseen professional about their problems. These moments are well-written, quiet vignettes that show the vulnerabilities in all of us. Then the comic has other scenes in the, "Present," where a whole bunch of slightly big-name heroes have been revealed dead (Arsenal/former Green Arrow Sidekick, Wally West/a fan favorite version of the Flash, some other ones you don't care about) and it is looking like somehow either Harley Quinn or Booster Gold murdered everyone who was at Sanctuary (and destroyed the therapy-robots). The comic of course plays-up the whole, "Was it the villain or the supposed hero?" element heavily as well as hinting that the confessionals heroes do at Sanctuary may not be as secure as assumed. It's the kind of over-the-top melodrama expected of big events (fights, deaths, mayhem!) and feels sharply counter to and out-of-place with the more introspective flashbacks full of heroes ruminating on such heavy topics as obsession, trauma, and putting on a brave face despite being terrified inside. From reading, "Heroes in Crisis," second issue it starts to feel even more like there was an idea for a slower-moving and meditative book that explored psychological concepts of what makes our supposedly selfless heroes tick and what kind of problems they deal with...and then it was decided to jam-in the elements of a big event full of blood and bodies to--I guess--give it more, "Oomph," and generate some headlines. 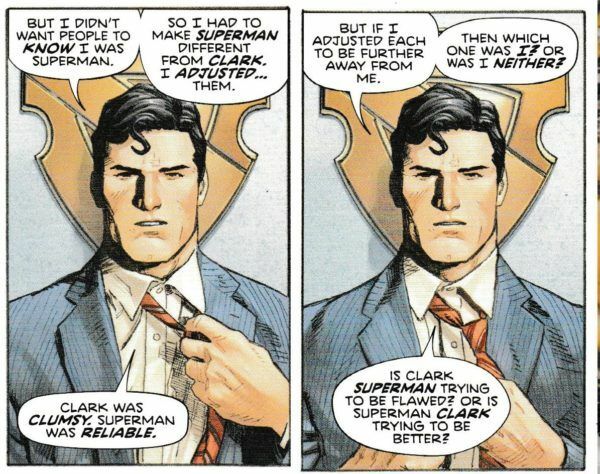 After all, "Superman struggles with clarifying his clumsy Clark Kent identity versus his heroic one," isn't quite the draw for clicks as, "DC killed Wally West!" It's a shame as there is a smart comic in here full of interesting considerations about heroism, but it finds itself overrun by the desire to have a, "Wham-Bam!" event full of fighting and, "Shocking," deaths that seem mandatory in any, "Shocking, world-changing event." Perhaps things will come together better as the book proceeds, but for now this is a slightly wasted mess of potential.